Zirconium selenomolybdate gel matrices were prepared by mixing solutions of zirconium oxychloride, selenous acid, and sodium molybdate in different manners. 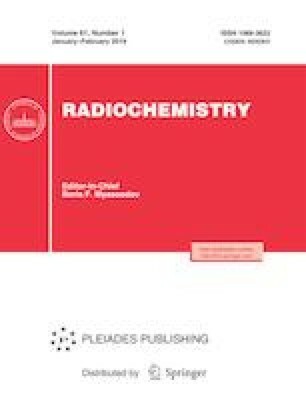 The elution of the generated 99mTc radioactivity from the obtained zirconium selenomolybdate-99Mo matrices was studied using small chromatographic columns of the matrix. 6 g of zirconium selenomolybdate-99Mo matrix dried at 50°C, packed in a glass column (1.1 cm i.d. ), was eluted by passing 10 mL of 0.9% NaCl at a flow rate of 1 mL min−1 and ambient temperature (∼25°C). The 99mTc elution yield of 77.1% was obtained. Radionuclidic, radiochemical, and chemical purity of the eluate proved to be suitable for use in medical applications.